It seems day one of British Pie Week 2016 came and went in a blur, with Pierateer Rob kicking off his #PiePledge of eating pie in England, Scotland and Wales with a trip to Cardiff! Meanwhile Pierateer Tim ate 7 pies on day one of his 7x7 challenge and Pierateer Sam DRANK a pie! Here’s some of the things we got up to on Day Two of British Pie Week! After spending day one away in Cardiff, picking up some Clark's Pies direct from their shop in South Cardiff, day two of British Pie Week was a bit more of a leisurely affair! A morning delivery of pies from Lewis pie company was followed by a twitter debate following the publication of a controversial pie news article by the Telegraph. While it has now been corrected, the original article misquoted the pie petition owner Bill T Wulf by saying a pie typically had a top or base of pastry, rather than what he actually said which was top and base. Two totally different things, I think you'll agree! It all led to the article finally being changed, as it now has been, but still the point is that a pie should be fully encased in pastry with clearly defined base, sides and lid, as we clearly state in our Pie Dictionary! 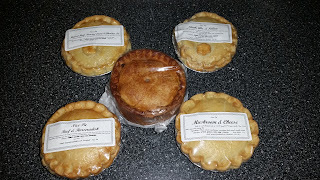 Having eaten two pies from Nice Pie the previous day, Pierateer Rob was also able to get his reviews up and both were Pierate Highly Recommended! Click here to read the reviews of the Steak, Ale and Stilton and the Braised Beef, Roasted Onion and Cheddar Pie! For evening meal I started on the Wilfreds Pie Range from Lewis pies, having their lamb, steak and potato and chicken and vegetable pies. The reviews will come soon, followed by the other three pies in their range later in the week! All were nice, decent pies for £2-£2.50, even if they could have done with a bit more filling to get a top score on the 7 Cs of pie rating. The evening was rounded off with a couple of the Clark's pies I got in Wales, when Pierateers Sam and Tim arrived for a pre-British Pie Awards catch up! On Day Two Pierateer Sam continued his unique ways to eat pie series with a Pie Kebab. This followed Sam drinking - yes, that's right, I said drinking - a pie in yesterday's pie-nt challenge, which you can watch the video of here.